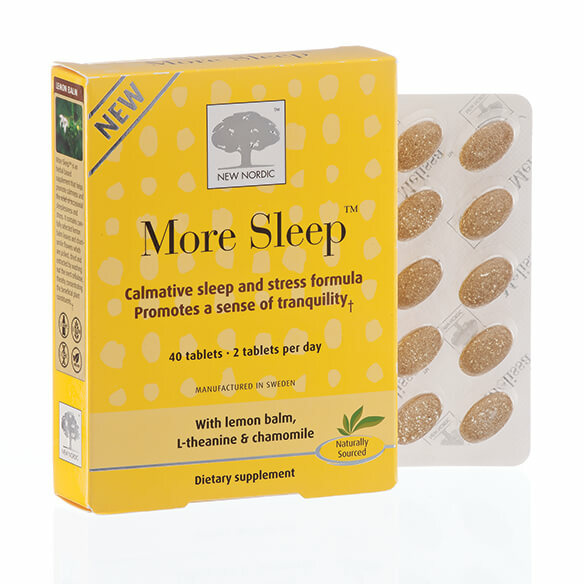 Relieve stress and maintain a normal restful sleep with this calming New Nordic More Sleep™ formula. The unique micronutrients and herbal extract combination in each sleeping tablet promote relaxation and allow you to wake up refreshed and rested. The naturally sourced formula contains no melatonin. To use, take 1 tablet when needed to relieve occasional daytime stress. To promote restful sleep, take 2-3 tablets 30-60 minutes before intended sleep. Adult: Take 1 tablet when needed to relieve occasional stress during the day, up to 3 tablets per day. 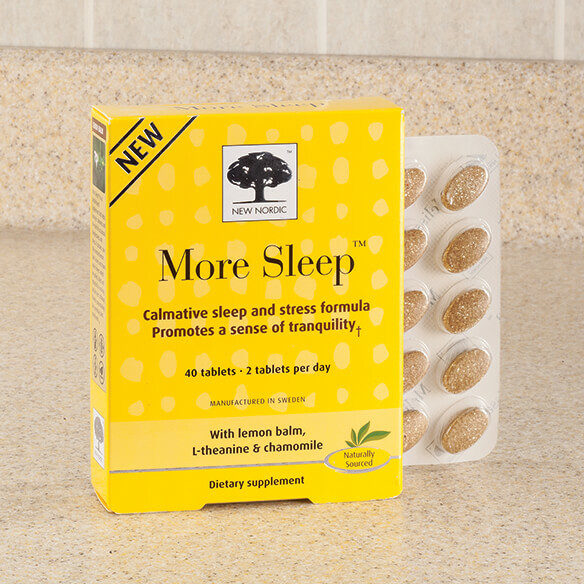 To promote restful sleep take, 2-3 tablets 30-60 minutes before intended sleep. Warning: Keep out of reach of children. Do not take if you are pregnant or breastfeeding or below 12 years of age. Consumption with sedative acting products, alcohol, is not recommended. Consult a doctor if sleeplessness persists (chronic insomnia). Do not use if you are allergic to plants of the Asteraceae (daisy) family. Lemon balm (Melissa officinalis L.) (Herb) (10:1) 300mg, Chamomile (Matricaria chamomilla L.)(Flower)(5:1) 100mg, L-Theanine 66mg, Thiamin (Vitamin B1) (as thiamin momonitrate) 1.47mg, Riboflavin (vitamin B2) (as riboflavin) 0.54mg, Niacin (Vitamin B3) (as nicotinamide) 6mg, Vitamin B6 (as pyridoxide HCI) 0.67mg, Vitamin B12 (as cyanocobalamin) 0.3mg, Magnesium (as magnesium oxide) 100mg. Non-medicinal ingredients: Microcrystalline cellulose, glycerol, crosslinked sodiumcarboxy methylcellulose, magnesium stearate, hydroxypropylmethyl cellulose, silicon dioxide.